I wrote this excerpt for one of my Punk Planet columns (PP 36, March/April 2000) over ten years ago. Apparently, I’ve been writing about the politics of fashion and beauty for a long time. I’m leaving town for several weeks, so updates will be sporadic at best. Meanwhile, check Thread & Circuits for the continuously updated archive of my wayward youth as a pissed-off punk rock feminist zinester. 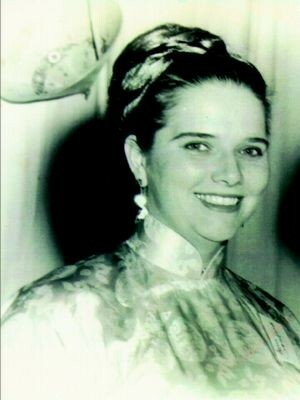 Photograph of author Ann Caddell Crawford in Saigon, 1963, wearing an ao dai. “The women of Vietnam have, in my opinion, one of the most beautiful national costumes in the world. It is called the ‘ao-dai’. The over-dress is form-fitting to the waist, with long tight dresses. At the waist, two panels extend front and back to cover the long satin trousers underneath. Correct fit dictates that the pants reach the sole of the foot, and are always slightly longer than the dress panels. Occasionally lace is sewn around the bottom of each leg. Tradition has kept the color of the pants of the ao-dai to black or white. “When a woman sits down, she takes the back panel, pulls it up and around into her lap. When riding a bicycle, they often tie the back panel down to the back fender to keep it from getting tangled in the wheels. Often, girls can be seen riding along the streets of Saigon on motor bikes with the back of their ao-dai flying loose, causing foreigners to comment that they look like butterflies, and beautiful ones at that. It bears mentioning again (or more explicitly) that this book was written at the height of U.S. involvement in Southeast Asia and that the author’s husband was a U.S. Army officer assigned to the Military Assistance Command in Viet Nam. The appendices include “Useful Phrases in Vietnamese,” some of which are too obvious: “Show me some identification,” “The wound is infected,” and “They are surrounded.” These are, after all, the material and historical conditions that made it possible for suburban American housewives to sport the next new “exotic” look at their dinner parties, “reminiscent of butterflies” while serving casseroles and blood-red meatloaf. Fashion has politics and (sometimes-bloody) histories, you know. On the other hand, I do hold to the argument that the alienation of indigenous objects or tropes is distinct and different from these other instances. (I’m thinking about Richard Fung’s comments.) More on that some other time, though.